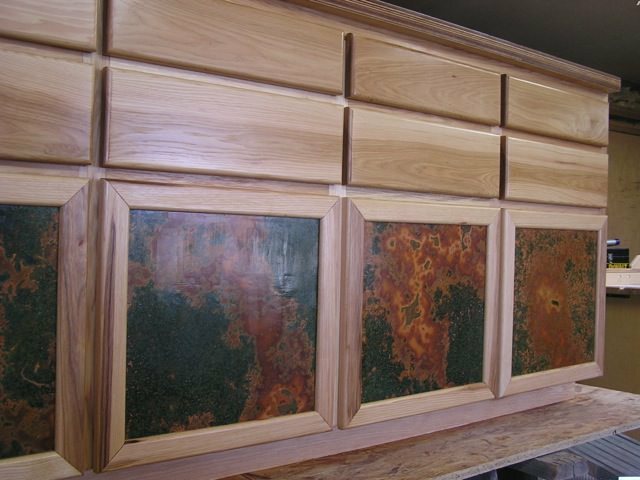 The photo of these gorgeous wood kitchen cabinets with copper inserts was submitted by Larry Humphrey. He is an amateur carpenter who built these cabinets for his daughter and son-in-law, and then added the copper sheet inserts into the doors. The wood is hickory with a clear coat varnish, and the copper used was a 5 mil roll in the designer patina pattern called "Verde." He used a piece of plywood for the door insert and attached the copper with a spray on adhesive. He sprayed the adhesive on both the plywood (previously cut to size) and the copper sheet, and then waited until it was tacky. The copper was placed on top of the wood and then rolled with a rolling pain to help secure the attachment. He turned the piece over so that the copper could be trimmed to the exact size with a knife, and then placed the insert in the cabinet. The entire unit was sealed with 3 coats of polyurethane, applied with a foam brush, with a light sanding between coats.